The UK airline BMI has reported its first pre-tax loss for 10 years after the carrier was hit by the wider downturn in the industry. The airline posted a pre-tax loss of £19.6m for 2002, compared with a £12.4m profit the previous year. Chairman Sir Michael Bishop described 2002 as an "exceptionally tough trading environment" and warned that 2003 also promised to be a "tough year". But the airline did manage some good news, reporting a record 7.5 million passengers during 2002. Like most airlines, BMI faced a struggle for business in the post-September 11 downturn in air travel, which was made worse by the global economic slowdown. The run-up to the war in Iraq also hit confidence in air travel, but BMI said recent signs had been hopeful. "The very recent signs of a slight upturn in confidence and bookings following the latest developments in Iraq may provide the prospect of a return to a more stable operating environment in the second half of the year," Sir Michael said. He added that the airline's "vigorous cost-cutting programme" and greater efficiency would put BMI "on a sound footing in volatile market conditions". 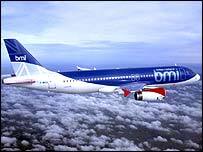 BMI said the growth of its budget airline BMIbaby was "encouraging" with 700,000 passengers carried last year, and three million expected in 2003.